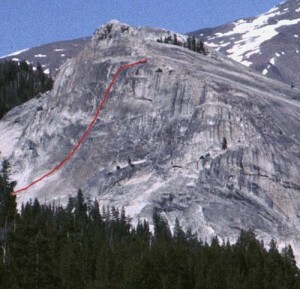 A technical and unique pitch, this is an excellent route with cool liebacking and stemming between folds of rock. The best approach is to climb Beginner’s Route. You can also scramble onto the base ledge from the top on your way down from another route, or after topping out on routes like Water Cracks. A runout 5.8 start leads to tightly bolted face. Finish with some slab climbing to the anchor. Pitch 2 is 5.8 and is severely wandering, flakey, and has no pro. A single rap with one rope returns you to the ledge. Which SuperTopo guidebooks include a topo for Mega Bleam?